Страницы: Пред. 1 ... 25 26 27 28 29 ... 43 След. 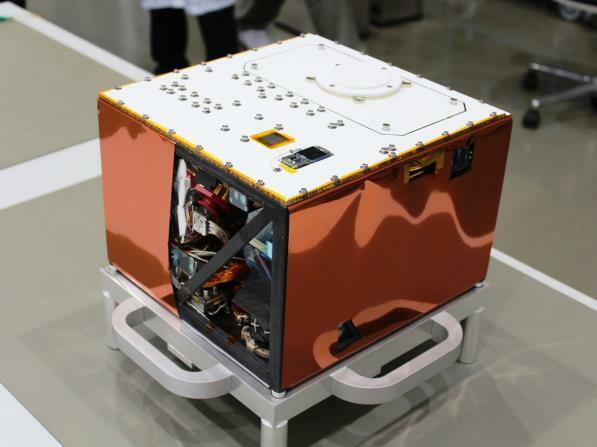 MASCOT (Mobile Asteroid Surface Scout) is the asteroid lander jointly developed by DLR (German Aerospace Center) and CNES (French National Center for Space Studies). 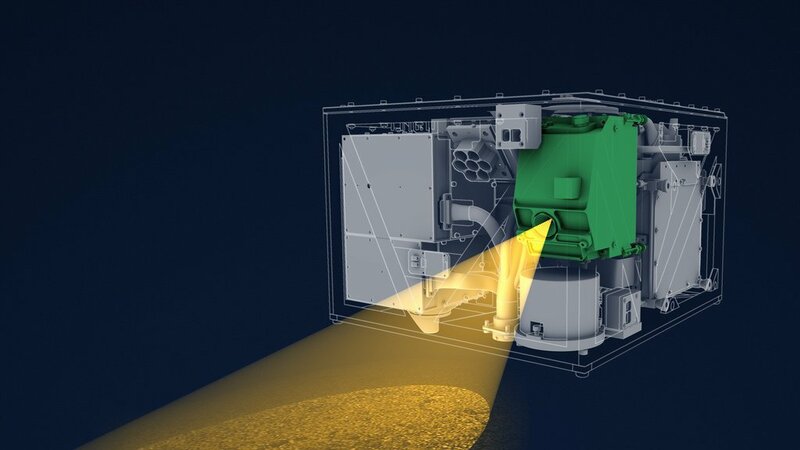 MASCOT is stored on the -Y-plane side of Hayabusa2 (this is the left-hand side surface when the high gain antenna is at the head and the ion engine is at the spacecraft back) and deployed fr om this position (see Figure 1). MASCOT also has a hopping mechanism similar to that of MINERVA-II1. Using a motor to rotate a swing-arm within the lander, MASCOT can change its attitude or jump. 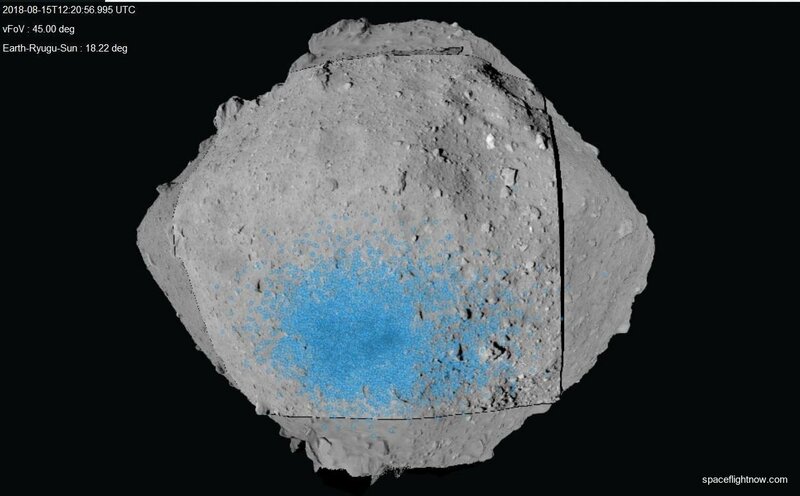 Since MASCOT is designed to operate in the position wh ere the top antenna is directed upwards and the spectroscopic microscope faces downwards, this hopping mechanism can correct the attitude if the lander is in a different orientation once on the surface of Ryugu. MASCOT can also use the hop to move locations once; the lander does not hop multiple times like the MINERVA-II1 rovers. MASCOT Lander‏Подлинная учетная запись @MASCOT2018 9:05 - 2 окт. 2018 г.
I’ll do many things! I’ll be there for two asteroid days & take lots of pictures. I've a very neat camera equipped with leds so I can take pics even if it's very dark! And maybe I'll even be able to see a boulder from the side! 小惑星探査機「はやぶさ２」‏Подлинная учетная запись @haya2_jaxa 13:37 - 2 окт. 2018 г. 【MASCOT】 3 октября 05:35 JST, высота около 2000 м.
Фотография была сделана камерой ONC-W1 около 5 часов по японскому времени. HAYABUSA2@JAXA‏ @haya2e_jaxa 15:34 - 2 окт. 2018 г. 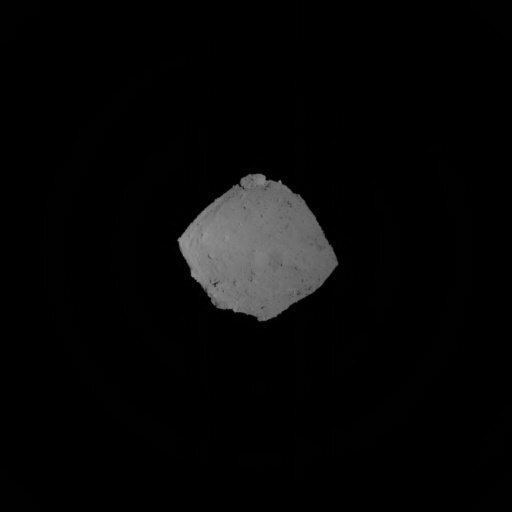 Here's the latest view from Hayabusa 2's wide-angle navigation camera, showing asteroid Ryugu from a range of about 1.5 kilometers (1 mile). This image was captured at 2217 GMT (6:17 p.m. EDT). 2320 GMT (7:20 p.m. EDT): Hayabusa 2 begins communicating through JAXA's Usuda ground station in Japan. 0030 GMT (8:30 p.m. EDT): Hayabusa 2 is 500 meters (1,640 feet) from Ryugu. 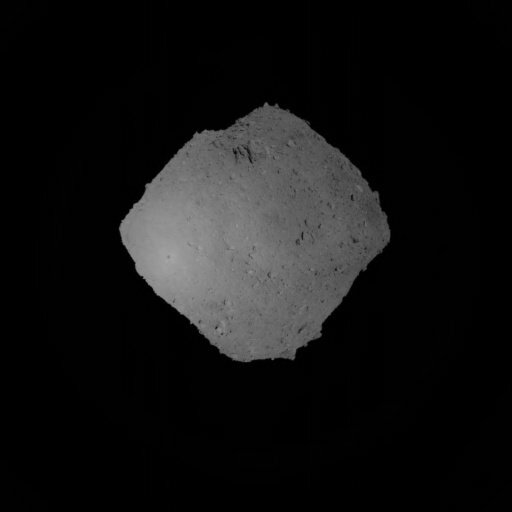 0120 GMT (9:20 p.m. EDT): Hayabusa 2 is 250 meters (820 feet) from Ryugu. 0151 GMT (9:51 p.m. EDT): This is the approximate time Hayabusa 2 reaches a target altitude for deployment of MASCOT around 60 meters (196 feet) from Ryugu. 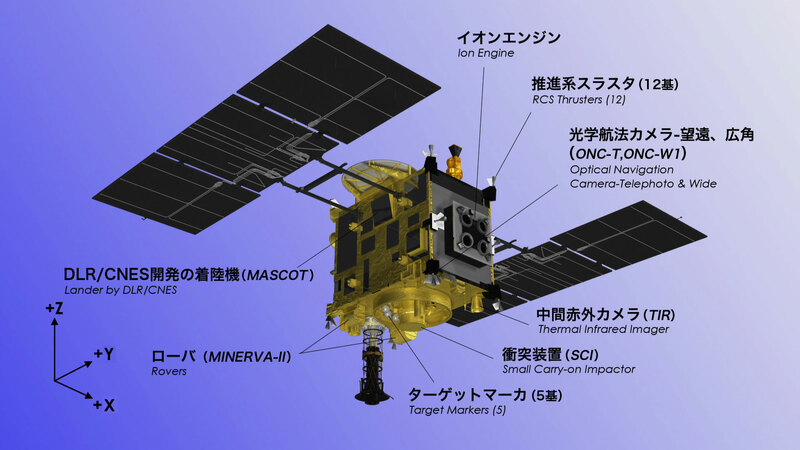 Hayabusa 2 will slow its approach from 10 centimeters per second to 3 centimeters per second (0.22 mph to 0.07 mph). 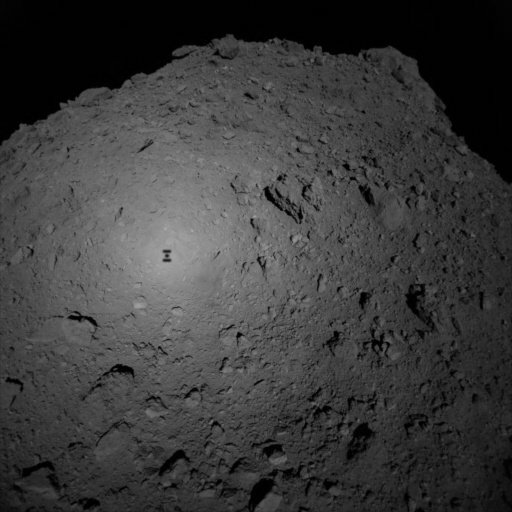 0155:35 GMT (9:55:55 p.m. EDT): Hayabusa 2 shuts off its control thrusters and enters a free fall toward Ryugu, tugged by the asteroid's tenuous gravity. 0158:15 GMT (9:58:15 p.m. EDT): MASCOT is released from Hayabusa 2. 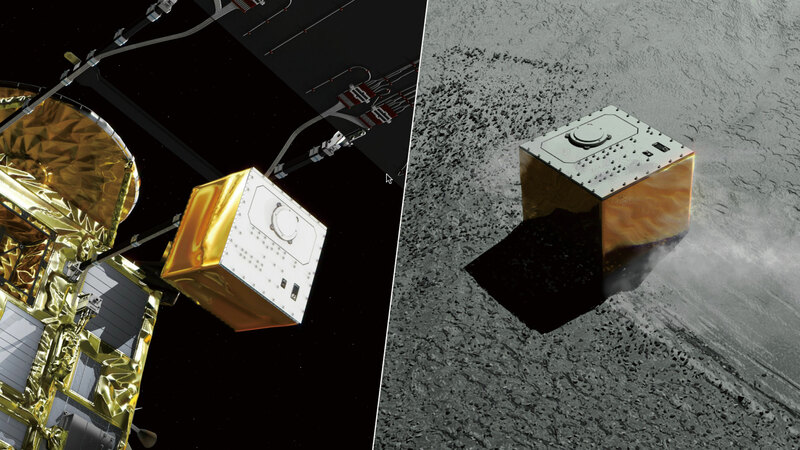 It will take anywhere from 5 to 10 minutes for MASCOT to reach the asteroid's surface, and the robot is predicted to touch down at a velocity of around 20 centimeters per second, or less than 0.5 mph, seven times slower than a human's average walking pace. 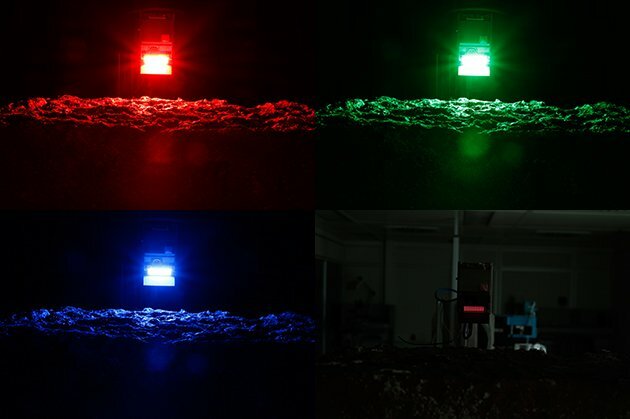 The battery-powered robot will likely bounce across the asteroid a few times after landing, then settle into place to begin its 16-hour science campaign. MASCOT carries an uprighting mechanism to ensure its instruments and antennas are pointed in the right direction, and an internal swing arm is available to allow the rover to hop to different locations on the asteroid during its mission, which is limited by the craft's battery power supply. 3 октября в 7:30 JST зонд опустился до высоты 1000 м и начал переход к фазе сближения. 小惑星探査機「はやぶさ２」‏Подлинная учетная запись @haya2_jaxa 16:32 - 2 окт. 2018 г. 3 октября 8:50 JST - зонд продолжает спуск до высоты около 800 м. Камера снова может фиксировать собственную тень зонда. Фотографии реального времени - ※ по ссылке. 小惑星探査機「はやぶさ２」‏Подлинная учетная запись @haya2_jaxa 16:51 - 2 окт. 2018 г. The region marked in blue in this image is the target landing zone for MASCOT. 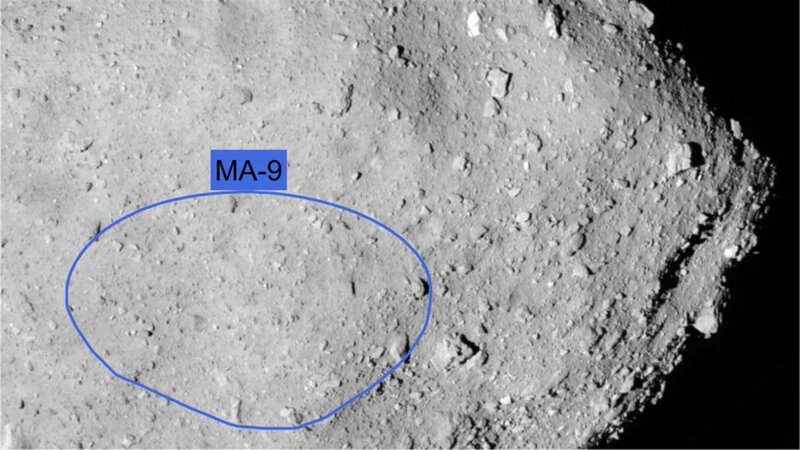 There is some uncertainty over where MASCOT will end up after bouncing across the asteroid's surface, but the targeted touchdown location is situated in the southern hemisphere of Ryugu, at around 30 degrees south latitude. The robot could end up anywhere within around 200 meters (656 feet) of the targeted landing site, according to the German space agency, DLR. MASCOT Lander ‏Подлинная учетная запись @MASCOT2018 17:37 - 2 окт. 2018 г. Officials at DLR's lander control center report MASCOT is powered up to start collecting data during its final descent. 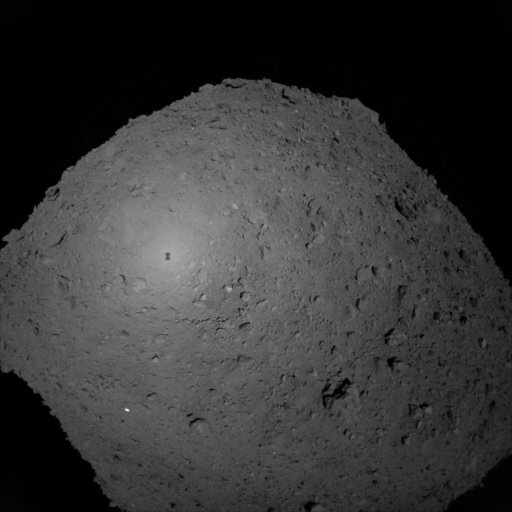 JAXA says Hayabusa 2 was at a distance from Ryugu of around 400 meters, or 1,300 feet, as of 0110 GMT (9:10 p.m. EDT). DLR - English‏Подлинная учетная запись @DLR_en 18:23 - 2 окт. 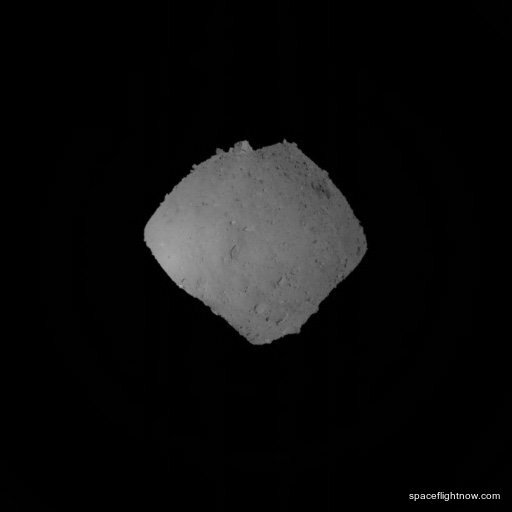 2018 г.
Hayabusa 2's shadow is growing in size as the spacecraft nears the asteroid. Высота над местом высадки около 220 м. Изображение получено станциями ДКС в 10:12 JST 2018-10-03. Makoto Yoshikawa, JAXA's Hayabusa 2 mission manager, just briefed reporters in Sagamihara, Japan, on the progress of the spacecraft's descent. "We are moving according to the schedule as planned," Yoshikawa said. HAYABUSA2@JAXA‏ @haya2e_jaxa 19:00 - 2 окт. 2018 г. [MASCOT] Spacecraft altitude is now about 150m. 小惑星探査機「はやぶさ２」‏Подлинная учетная запись @haya2_jaxa 19:02 - 2 окт. 2018 г.
HAYABUSA2@JAXA‏ @haya2e_jaxa 19:26 - 2 окт. 2018 г. [MASCOT] MASCOT has a lithium primary battery that will last approximately 16 hours. This is about two asteroid days on Ryugu! Once the battery runs out, the lander operation will end. Jonathan McDowell‏Подлинная учетная запись @planet4589 20:03 - 2 окт. 2018 г. Still no word from JAXA or DLR on the status of MASCOT as far as can tell.